At least six people have been killed and scores more injured ahead of the Christmas break after a strong storm has hit the South and Midwest of the US. The storm has been described by forecasters as particularly dangerous. Authorities in parts of Mississippi – where a seven-year-old was among those killed – are conducting a house-by-house search-and-rescue operation after the state was hit by multiple tornadoes. Planes at a small airport in the north-west of the state were overturned and an unknown number of people were injured. “I’m looking at some horrific damage right now,” Clarksdale Mayor Bill Luckett was quoted by the AP as saying. 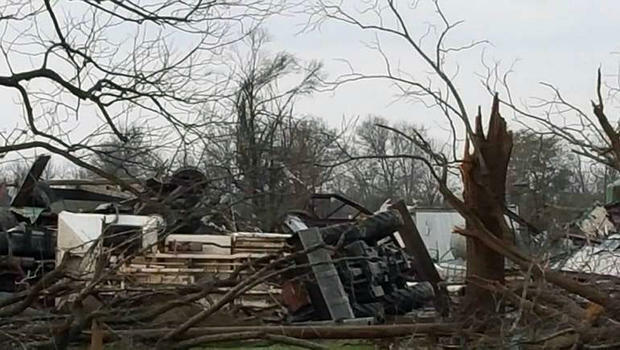 Mississippi’s I-55 was closed in both directions as the tornado approached, the state’s Highway Patrol said. The bad weather is also due to hit – or has hit – the states of Kentucky, Alabama, Indiana, Illinois, Missouri and Alabama. The national Storm Prediction Center in Oklahoma has released a “particularly dangerous situation” warning for the first time since June 2014, AP reports, when two massive tornadoes destroyed a rural Nebraska town, killing two people. The possibility of bad weather just before Christmas in the US is not unusual, officials at the center say.